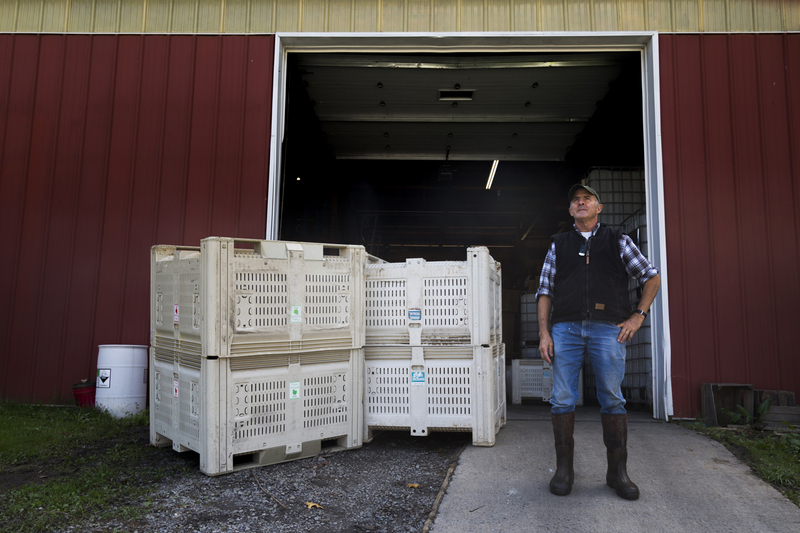 Larry Voll arrives at Soergel Orchards around 6:15 a.m. every morning to begin making cider. An apple a day keeps the doctor away, but a 20-bushel of apples makes 75 gallons of cider. Nothing screams “autumn” like cozying up in a plush sweater with a drink — of apple cider, of course — in hand. And for Pitt students in search of a local cup of the fall beverage, they won’t need to travel far. Soergel Orchards, located about a half hour north from campus, crafts its own apple cider in-house at its Wexford location. They sell the finished product in Soergel’s Market and ship it elsewhere, like Mercy Hospital and the Penn State cafeteria, to sell. “I’m sure that’s not what you want to hear, though,” Larry Voll, a co-owner of Soergel’s whose children are Penn State alumni, said. Soergel’s cider-making process is housed in a barn on the farm’s property. Cider-making may appear complicated amid a mess of machines and noises, but at its core, making cider is an intuitive craft — squish apples, make juice. To get to the source, makers don’t have to travel far. It all starts in the backyard. 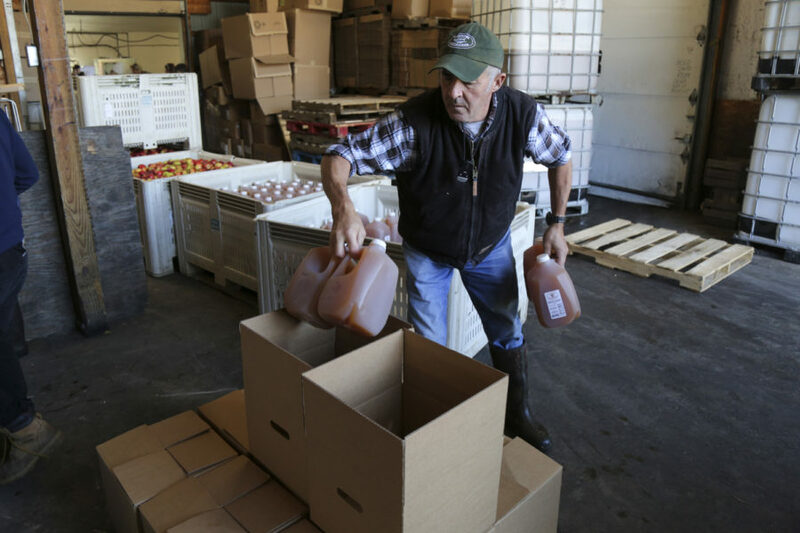 Co-owner Larry Voll said with the 7,000 gallons of cider produced each week in the fall, Soergel’s just doesn’t grow enough apples itself to sustain the juicing. 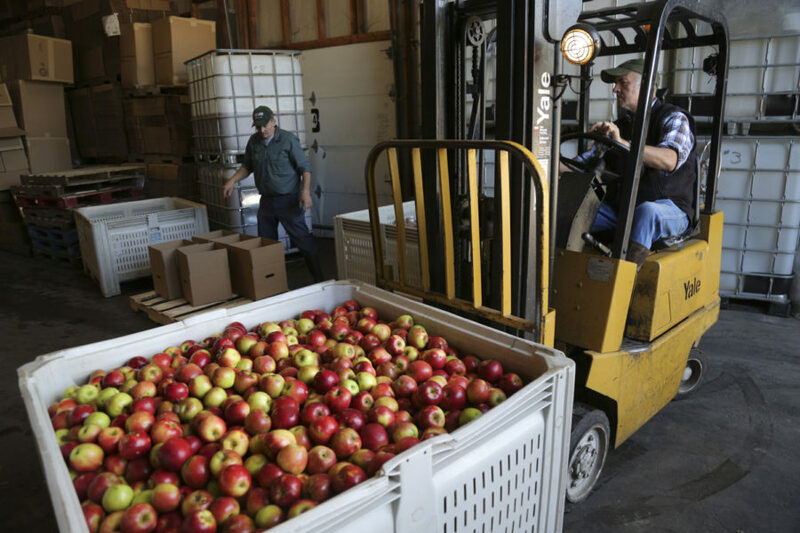 So, it brings in apples from places such as New Castle and Chambersburg to supplement its apple supply. “It’s the cider season!” Voll said. Though business owners often don suits and sit in offices, Voll’s stomping ground is the cider house — where he arrives as early as 6:15 a.m. every day, clad in a long, dark-green rubbery apron, tall black boots and noise-reducing ear covers. As the morning wore on, Voll quickly and excitedly explained his juicing process over the noise of various processing equipment, zipping forklifts and the chatter of children on a field trip outside. Co-owner of Soergel Orchards Larry Voll moves a crate of Crimson Crisp apples into the cider house. This batch is destined for Arsenal Cider to be turned into hard cider. Soergel’s uses seven types of apples in its cider — red delicious, golden delicious, ida red, jonathan, macintosh, gala and honeycrisp — which Voll rattled off as quickly as someone would be able to list their siblings. They’re mixed together in the final product, which makes for slightly different flavor notes in each jug. The apples are stored in 20-bushels, or big boxes, each yielding about 75 gallons of juice after pressing. Stacked floor to ceiling, the unpressed fruits wait for workers in a 34-degree walk-in refrigerator along with the completed bottles of cider. 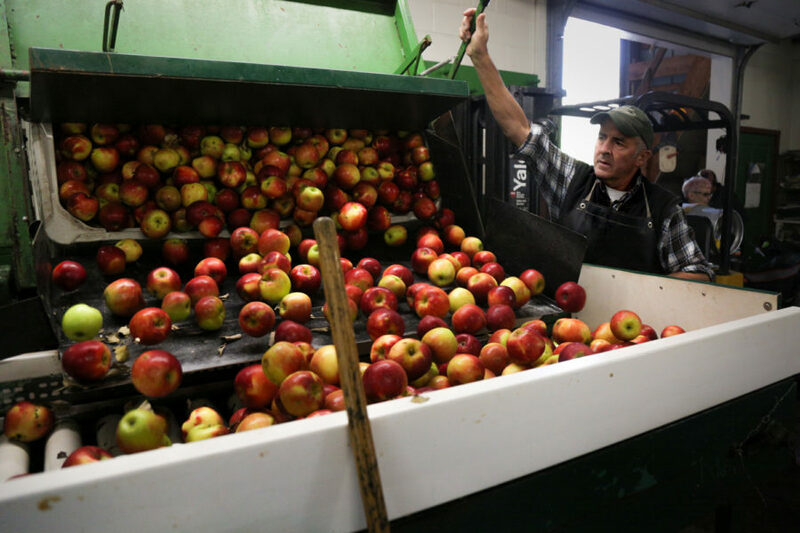 To start the juicing process, workers forklift one 20-bushel of apples at a time into a machine that dumps the apples onto a large green receiving table. The apples then go through a washing station and are pushed onto an elevator. The apples creep slowly upwards, then drop through a chamber that contains blades that pulverize them into what Voll says is basically applesauce. 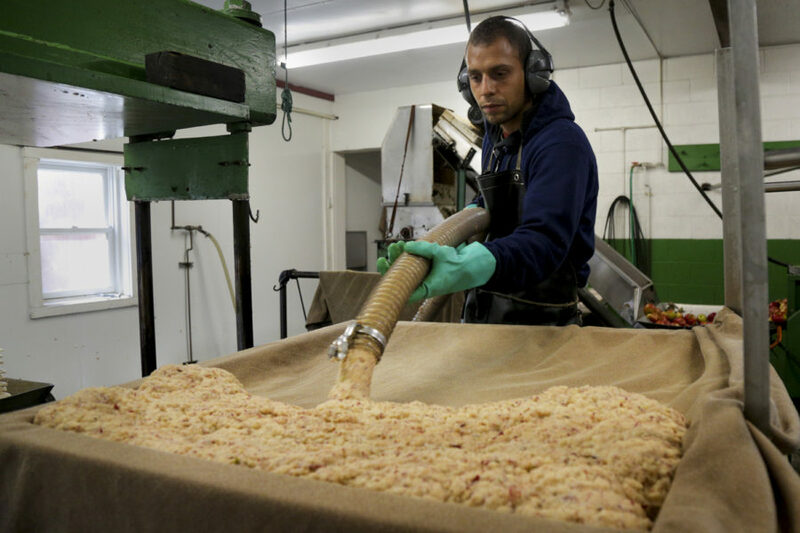 Jose Santiago spreads the pomace — the apple’s pulp that is used to extract its juice — around plastic trays in preparation for the pressing. Next comes the actual juicing process. The applesauce is poured through a hose and layered between sheets of a nylon blend and plastic spacers. 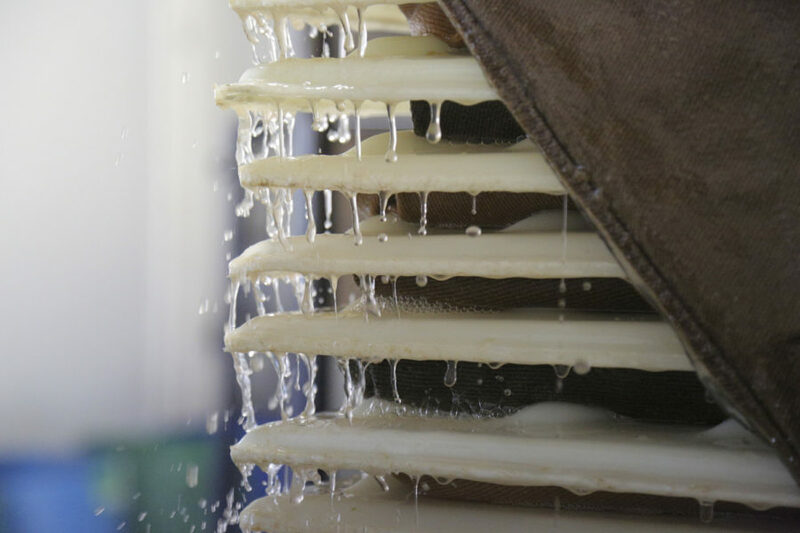 After 15 layers, they are slid into a machine press that applies 55 tons of force to the stack, raining a steady stream of apple juice. It goes into a vat under the machine, where it’s transported through a maze of tubes into the next room into a holding vat. Each holds about 600 to 700 gallons of juice. Raw cider is collected in 275-gallon tanks as the pomace-filled trays are pressed by 55 tons of pressure. The solid matter left at the end of the process — which seems minimal compared to the vast juice content — gets dumped into a trough and pushed into a dump trailer outside the building, to be used as fertilizer at the orchard or given to local farmers to feed to their pigs. Voll said that Soergel’s pasteurizing process is the same as a dairy’s. A series of pipes carries the cold, unpasteurized apple juice to the heater, where it is heated to 172 degrees by steam for at least 10 seconds to kill all the potential bacteria and impurities. It’s then transferred to another holding tank overnight to allow all the sediment to fall to the bottom. From there, it’s bottled in-house and sold in their market by the gallon, half gallon, quart and pint. Currently, they also offer seasonal cherry and honeycrisp flavors. After pasteurization, the finished product is bottled by “juggers” like Kathleen Davison. Soergel Orchards also hosts a branch of Arsenal Cider House, a Lawrenceville-based ciderhouse and wine cellar specializing in hard apple cider, cider-style fruit and grape wines and mead. The partnership started before Arsenal Cider was even a business — co-founder Bill Larkin used the cider to make his own hard cider at home. Then, when he and his wife Michelle learned they were pregnant with twins, they opened the business as a way to work while spending more time as a family. Arsenal Cider produces a variety of flavors — ranging from pumpkin apple to rhubarb and cranberry — and uses Soergel’s unpasteurized cider as the base for all of them. Larkin also said cider is naturally gluten free — both normal and hard varieties. Larry Voll boxes prepared cider to sell in the final steps of the cider-making process. According to Voll’s son, Eric Voll, non-alcoholic cider is most frequently purchased by the gallon. The orchard produces and sells cider year round, but this fall has sold as many as 100 gallons per day — and it should last for up to five weeks in a residential fridge. “But I hope people finish it before then so they get more,” Larry Voll said.